Do-It-Yourself (DIY) Removals or a Removalists company, Pick the perfect one! Moving your house within a local city or across the states in Australia could be a challenging affair for you. Even, it could be rather confusing for you to decide the best one- Do-It-Yourself (DIY) Removals or a Removalists company. Being an age-old question, many people find the DIY option a less risky and more economical choice than hiring a Movers or removalists company serving across the cities and suburbs in Australia including Enfield, Richmond, Gawler, Salisbury, Brighton, Elizabeth, and Prospect. If you are also facing a stressful task of moving house and seriously considering for a DIY to save some money then you should first evaluate all gotchas that may come right behind this hasty decision. So, you should be careful, otherwise, you may end up losing more than you’ve hoped to save. On the other hand, if you opt for hiring a professional and experienced removalists company like CBD Movers not only ensure you a safe and stress-free moving of your households but also helps in reducing total time and cost of a move. Of course you can not match the experience and skill-set of a professional movers Elizabeth. A moving process involves scores of challenging and stressful tasks like removal, packing, loading, and transfer of belongings that need to be handled carefully with perfection. So, if you are thinking to move your big size households and bulky furniture by yourself then you will be held responsible for anything that goes wrong to add up the hassles and cost of moving. Usually, people may consider removalists or movers as the most expensive option for your move, but it’s worth evaluating the real costs for yourself. The actual prices of each of your move may vary as it depends on the total distance covered and the size of your furniture. Ask a free quote from different movers Richmond companies, then compare each of them carefully to narrow down your list of options to two or three. Confirm your moving dates and time along with the size of belongings you need to move, this will help a professional removals service company to provide you more-accurate quote. Don’t forget to ask your hired movers company if they provide packing boxes and supplies to pack your things. Do they provide options to do only part of the moving job with DIY? or Do they offer insurance cover for every step of the move? Carefully, compare the cost of a quote you will receive from a removalists company Prospect versus the costs of moving yourself including the truck rental, purchasing boxes and tape, and paying labour to help you. In this way, you can calculate, and analyse the total cost of relocation with your DIY moving option that will sure to add up your moving expense when compared to the cost of hiring a full-house expert removals Paralowie services company. So, without any doubt, you can opt to hire a professional and reliable removalists Gawler service provider to eliminate all your moving hassles and stress of being responsible for anything that goes wrong. So, in the final words, even if you are considering to handling the entire move by yourself, it is worth contacting and inviting expert movers company into your current home to determine the best option to choose either from a DIY or a removalists company. 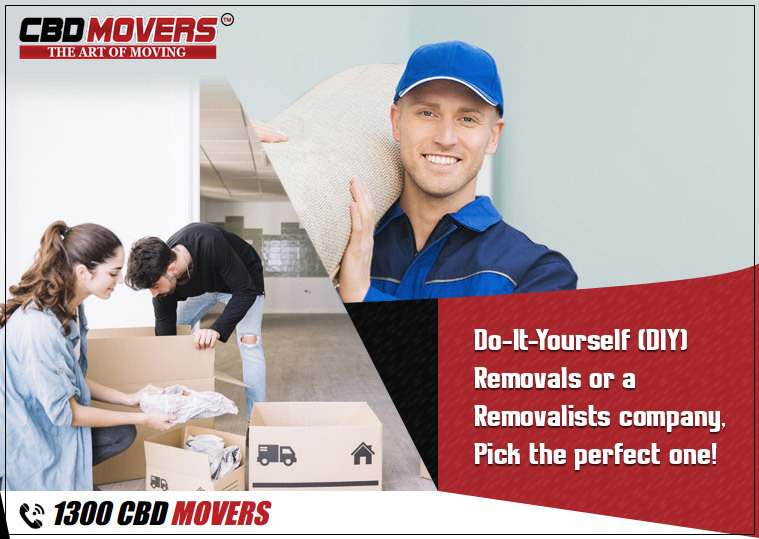 CBD Movers is nationwide applauded for its reliable and cost-effective Removalists services across the cities and suburbs in Australia including Enfield, Richmond, Gawler, Salisbury, Brighton, Elizabeth, and Removalists Prospect. If you have any questions related to this article just reach us or leave your message in the comment box.